If you are interested in attaining a recognised Clinical Hypnotherapy diploma in 2013 then continue reading to discover how you can become a Clinical Hypnotherapist. Clinical Hypnotherapy training is in two parts. Firstly an NLP Practitioner training for the foundational skills and following on from this the second part of a Clinical Hypnotherapy training. NLP Practitioner Training ( 18 days ) in Newcastle upon Tyne starts January 2013 and the Clinical Hypnotherapy component ( 10 days ) begins in August 2013, completing in December 2013. Twenty eight days training for under £1200 is for people who want to create and foster new and better opportunity in your life. Attendees will expand and increase your interpersonal and relationship skills as well as developing competent and competence in using hypnosis to help your clients make lasting changes. You will learn how to use powerful therapeutic, self development and coaching tools in a participatory and stimulating environment. With this Newcastle NLP Practitioner training and Newcastle Clinical Hypnotherapy Training, the accent is on experiential learning through doing and having fun while you learn. Prometheus, the recent Ridely Scott film asks questions that penetrate deep into the soul of humanity and creation. Pointing back in time ans ask the where and what’s of creation and forwards in our time to how our civilisations might evolve. These deeper questions can evoke a search to discover a deeper meanings in our own life, now. Read on to discover what people are saying about the NLP Practitioner component! studies with Nuns from The School Sisters of Notre Dame in Aging with Grace by David Snowdon shows how a mentally stimulating environment can help people to live longer, healthier and more meaningful lives. Statistically we are all more likely to live longer than our parents and with medical interventions, better diet and exercise we may live a lot longer. Part of living longer has something to do with having purpose and meaning in our lives. Learning how to use our minds more efficiently and with purpose actually increases the density and weight of our brains. Learning actually stimulates neuronal growth and development. NLP Practitioner Training is easily accessible from the following locations shown below. NLP Practitioner in Newcastle upon Tyne, beginning January 2013. Complete Newcastle NLP Practitioner training course details and booking – click here. By exploring and understanding, through practice, how our thoughts and emotions can strongly influence our health, our outlooks and our ability to cope or prosper, we learn how to change and take responsibility for our own life and wellbeing. Like anything worth learning, you do need to take time and practice to embody new skills. With 18 days over six months there is ample time to practice and more fully integrate your new skills into your personal repertoire. To read and discover much more and in detail about the Clinical Hypnotherapy component, click here! 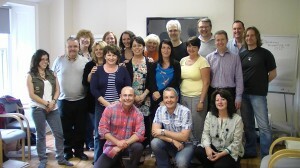 This January 2013 NLP Practitioner experience is a comprehensive 18 day training in the North East, Newcastle upon Tyne. The exceptional price is £595 and has been for several years. A less than comparable only 7 day NLP Practitioner trainings in London can cost between 2-3 thousand pounds. Exceptional value and not only in money Newcastle NLP practitioner training. In August 2013 the Newcastle North East Clinical Hypnotherapy Training begins. 10 days over five months with the unbeatable value of £595. Limited places of only 18 per training.